A few months ago I received an email from Mr. Cerqueira who very kindly asked me if I would be interested in reading and reviewing his new book, “The Tragedy of Fidel Castro”. I’ve never received a request of this kind and I was flattered. I was also very curious to read the book, because based on what’s been written about it, it seemed like something I would enjoy. Add to that that I visited Cuba two years ago and completely fell in love with Havana, it seemed only natural I’d accept the challenge. 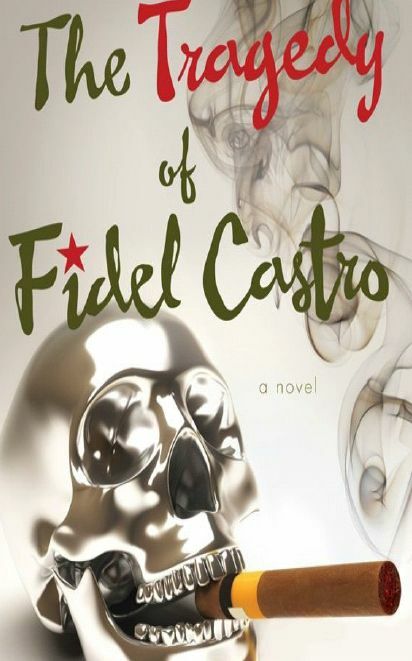 “The Tragedy of Fidel Castro” is a witty fictitious tale of events that precede an encounter and the encounter itself between two greatest enemies, Fidel Castro and JFK. People with a little more that vague, basic knowledge of the Cuban missile crisis, Bay of Pigs invasion and the US embargo against Cuba will certainly get much more from the book than I did, because I’m sure many playful references were lost on me. However, the book is so well-written and humorous, with such likeable characters, that a little ignorance of history can’t get in the way of enjoying it. The book opens with a conversation between God and his loyal earthly disciple, Fatima, who notifies him of the tragedy looming over our planet. It seems that a war is in the making between two of the greatest heroes who ever lived, Fidel Castro and JFK, and it doesn’t sound like it will have a happy outcome for Earth. Their conversation is funny and we see right from the start what a clueless being God is. He’s powerless against his creations, but only gives an impression of wisdom and being in control. He decides it is too early to react, and from then on, the two great warriors will be closely observed from the heavens. Following is a series of events on both the American and Cuban side that lead to the final battle. There we have a Cuban spy, Varadero, who fell prisoner to Americans and in whom JFK and his counselor take a keen interest, trying to gain knowledge from him about what their enemy is like. Again, the portrayal of the prisoner and his captors is intriguing because there’s always a danger of some revolutionary outburst in every setting of the story: the prison, the temple, people on the street. Prison is run by a Capitalism devotee who acts as a crazy radar for any sign of Communism in people around him, and ready to punish for it. Disregarding the plot for a moment, I focused on the writing and the beautiful images and similes created around the plot. There is a moment when JFK and his counselor are taking Varadero out of his cell to interrogate him, and there’s a great description of their shadows on the wall because of the light of the candle, and how one appears giant and two blend into one, then change shapes. Mr. Cerqueira never loses sight of the language nor lets it slither into ordinariness, and his metaphors and similes are always in the service of the character’s state of mind or the situation. While the Americans are preparing their strategy for war, Fidel Castro is having the hardest time in history of his revolution, because he feels the dissatisfaction of his people. Still, he never stops the demagogy and justification of his not very humane attempts at ultimate equality among people. And then, whether out of curiosity or as a first sign of surrender, Fidel decides that his country should open up to tourists, and the decision is met with incredulity and horror from his generals. However, one strict gaze from Fidel is enough to silence them and have his will carry through. But it’s clear to everyone that the time of Fidel Castro has passed. In this opening up of borders there is a particularly funny scene where Castro is disguised as a woman, checking out what discos with “capitalist” music are like and how his people behave, and he is spotted by Varadero who fled American prison and returned to his homeland. The situation is hilarious, though that is the only scene in the book that I felt unsure of, like it was only there for the comic effect and not serving any other motivation. Not to re-tell the whole story, by the end of the novel we’ll see many situations of Castro’s dilemma, darkest moments of the soul, and we’ll witness how the clumsy chess players from above, God and his son, try to play the game. What I like about the book is how the perspective of both sides is portrayed in fairness, Castro’s a bit more than JFK’s, because, after all, this is his tragedy. I like how both Capitalism and Communism are criticized, but with the intention of the author to make us see good in all people. To me it seemed that the author’s intention was to reverse history and humanity in general and place much more goodness and sincerity in the humankind than they really exists (in my opinion). Also, I really like and agree with the allusion to devil being inside of every one of us and how what we think of divine intervention is nothing more than our own actions and consequences of those actions. For the beauty of the language, unique point of view of Communism and Capitalism from within these ideas’ greatest advocates, and for the very entertaining characters, my reading of “The Tragedy of Fidel Castro” was a time smartly spent, and I’d like to thank Mr. Cerqueira for recommending it.